One of the last things people think or talk about with football is special teams. But these two players have managed to make a name for themselves and have created an unbreakable bond between them at the same time. 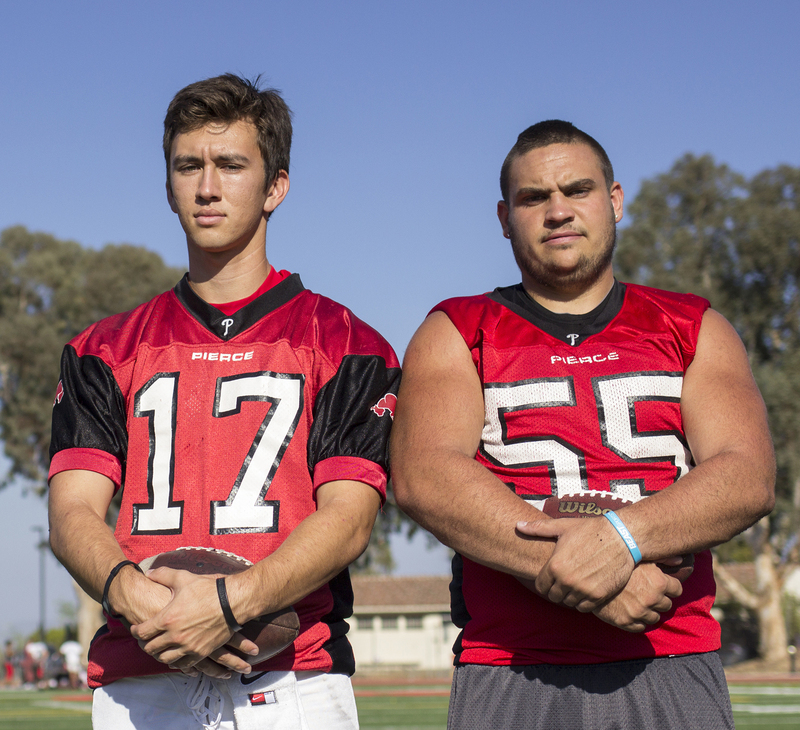 They met in 2012 during the Prepstar SoCal California Classic North vs. South All-Star game, became fast friends, but quickly moved on with their separate college lives. Two short years later, they would be reunited and playing football together again. Long snapper Blake Word and kicker and punter Jamie Sutcliffe, work together for the Brahmas on one of the most important and underrated parts of the team. Being a part of the special teams comes with a different kind of pressure and strong need for mental toughness. 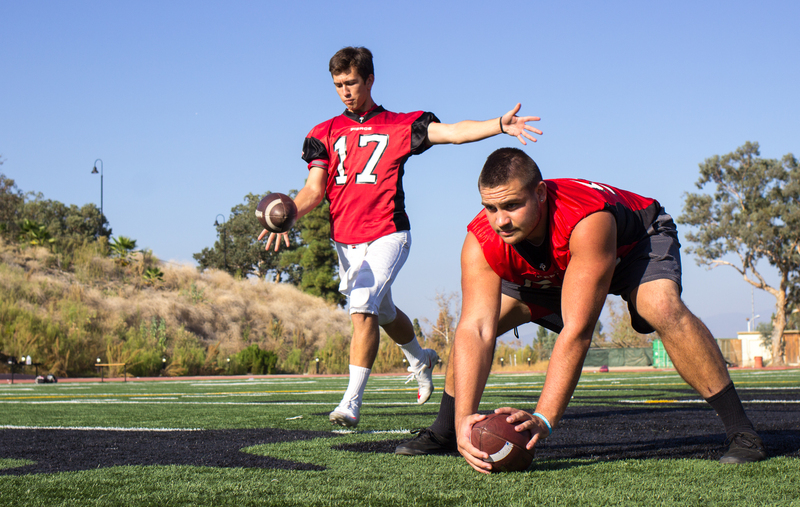 “In other positions you can make a mistake and have it go unnoticed, but as a long snapper, punter or kicker, all eyes are on you every time you’re on the field,” said Kicking and Special Teams Coach of four years, Bob Bognet. Sutcliffe, 21, recently transferred from University of Utah to Pierce College looking for a new opportunity. He has been playing football for six years but this is Sutcliffe’s first semester as a Brahma. He came to Pierce after his all-star teammate, Word, saw a post on social media suggesting he was leaving Utah and decided to tell Sutcliffe about Pierce football. “Blake went out of his way to talk Jamie into coming here. He knew we had an opening and he knew it was a good school for him to come to and showcase himself to go to the next level,” Bognet said. Word, 20, has been playing for the Pierce College Brahmas for two years. He started playing football when he was 8 years old for local teams like the West Valley Eagles and the Chatsworth Chiefs. Word’s father, who played football throughout high school before joining the Marines, encouraged him to play by putting him into different training camps and getting coaches to help Word build his game. “He has a great attitude, if you give him constructive criticism he “He has a great attitude, if you give him constructive criticism he doesn’t take it negatively, he takes it as a positive and he’ll fix it,” said Word’s long snapping coach, Chris Rubio. Rubio ranked Word amongst the Top 30 long snappers in the nation for the class of 2015. Kicking and punting coach, Chris Sailer, has ranked Sutcliffe as the number one junior college kicking prospect in the nation. Both players are hard-working and focused in making sure their game is always on point and that the Brahmas are successful. “The one thing my dad brought up to me was that he never gave up no matter what it was and to just keep working hard. Hard work will always pay off and it did for him,” Sutcliffe said. But Word and Sutcliffe have a special synergy that can’t be found with every kicker and long snapper duo. Bognet talked about the chemistry the players had even before Sutcliffe came to Pierce. “They had a chemistry already and when you’re together all practice, every practice as specialists, which is what these guys are, it just builds,” Bognet said. After hitting it off at the All-Star game, these decorated athletes have built an even stronger relationship and spend time together on and off the field. “My dad was jokingly saying if you have a really good snapper you make sure you treat him right,” Sutcliffe said. The two players have built camaraderie and besides their joking demeanor on and off the field, they had nothing but praise for each other. “No matter what, if I have a really good punt, if I have a decent punt, a bad punt, whatever it is, it doesn’t have to be a punt or just a kick in general, he [Word] will always give me props,” Sutcliffe said. “If I had to honestly say something about Jamie, it would be that I’m really glad that he’s here,” Word said.